Author A.J. Banner is back with a taut, atmospheric psychological thriller whose mystery begins after a once-estranged friend is invited to an engagement party, only to be subsequently discovered at the bottom of a rocky cliff. The story explores the deep fractures (and secrets) between those closest to us. 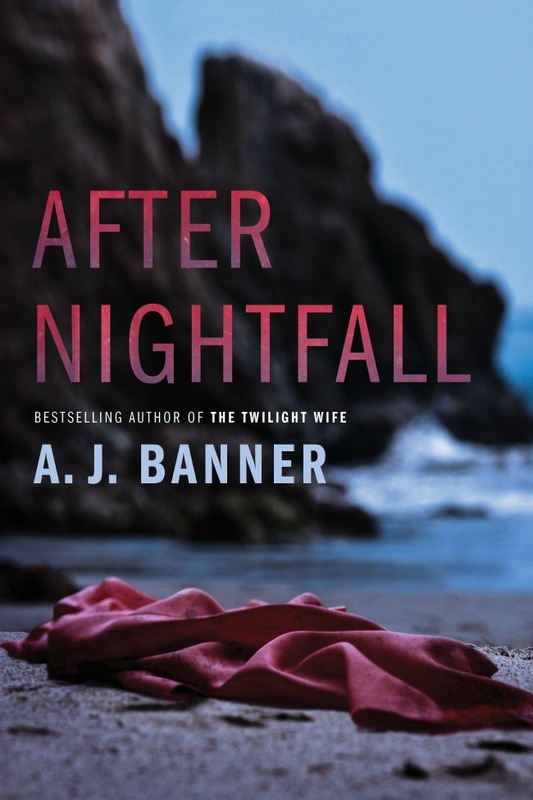 AFTER NIGHTFALL is out August 7th, but I’m so excited to share a sneak peek into this gripping suspense. I consider running after [Lauren], but there’s nothing she can tell me about Nathan that I don’t already know. But as she crosses the fifty-odd yards between the houses, she has already set me off-kilter. The mist swallows her, and I hear the distant slap of the screen door. I linger outside to quiet my thoughts. Anna’s silhouette appears at her bedroom window, the soft song from her jewelry box wafting toward me. The theme from Swan Lake. The haunting melody gives me the energy to go back inside and play the gracious host, newly engaged to a man who swept me off my feet. While I was treating Anna, I never imagined he would walk into my office and throw me for such a loop. He was in his blue uniform, just off afternoon shift. He said something like, Cool decor. His deep voice mesmerized me. That was it. Anna flew into his arms. Her problem was more difficult than most—she stammered midsentence and often lapsed into silence. But I worked with her on fluency shaping, focusing her breathing, alleviating anxiety, and slowly, over nearly a year, she improved. I hope she will accept me into her home. I hope she loves me as much as I love her. As much as I want to love her, if she will let me. For now, I savor a few more minutes in the fresh air. I follow the stepping stones back through the garden to the edge of a dense forest. Past these woods, the hillside drops gently to the beach, with a wooden staircase leading down I’ve counted 115 steps. A great cardio workout. No staircase exists on the Eklunds’ property next door. The bluff rises there, the cliff much steeper, treacherous. Beyond the Eklunds lives Arthur Nguyen, a sixty-something, divorced family-law attorney. The irony does not escape me. His much younger ex-wife and three daughters left him and moved to California. He consoles himself by walking his cairn terrier, Bert, and pretending to fish in the large man-made pond in his backyard. More of a mini lake. Nathan invited him to join us for dinner tonight, but he declined the invitation. I inhale the salty air, listen to the soft rush of the sea. We’re fifteen minutes beyond the outskirts of Tranquil Cove, a sleepy town of ten thousand residents, west of Seattle on the shores of Enchanted Bay, on the Olympic Peninsula—a protected, curved inlet meandering in from the Pacific Ocean. Idyllic, peaceful. I didn’t anticipate that Lauren and Jensen would buy the house next door to Nathan, but the dominoes fell in quick succession—a house up for sale with a view, a shortage of homes on the market, and the Northwest architecture about which Lauren had dreamed when we were kids. Exposed cedar beams, log cabin, vaulted ceilings, to die for, she told me. I want this house. The same architect built both homes—Nathan’s and the Eklunds’. Arthur Nguyen’s squarish, modern bungalow stands out on the corner, an incongruous anomaly. Jensen’s voice drifts through the air as the kitchen door opens. “Thanks, man—say thanks to Marissa.” He doesn’t see me out here in the dark. Hunched in his overcoat, he rushes home to join Lauren. He couldn’t stay away from her, after all. I head back inside and take off my coat. I put on a smile and bring out homemade chocolate cake for dessert, and later, after Keith and Hedra have gone to bed, I’m exhausted but can’t close my eyes. I see Lauren’s troubled face in the moonlight. Maybe I should have followed her home. But I didn’t want her to usurp the evening. I reach back for better memories of her, from a long time ago. When we were maybe eight years old, she helped me build sand sculptures at the beach. Together, we created two mermaids, fishtails intertwined in the sand. We’ll come out of the sea, Lauren said. And marry humans. And live happily ever after. Mermaid sisters. We were best buddies then, sharing hopes and dreams. Exactly when did our friendship crack apart? Was it years later, when we were young adults in college, driven by hormones and ambition? Or did a rift form between us earlier? After all this time, my memory blurs. In the master bathroom, I reach into the back of the medicine cabinet, find the sleeping pills hidden there. My doctor prescribed them three months ago for a bout of unexplained insomnia. But I only took one pill—it knocked me out cold. I shouldn’t take another one. I should be able to turn off my worries, and these last several years, I’ve mostly succeeded. I’ve excelled at my profession, treating over fifty students a week at the elementary school. I’ve helped thousands of kids overcome speech and language disorders. I’ve fallen in love with a loyal, caring man. My history does not rule me. I down the tiny pill with a glass of water, and in the living room, I kick off my shoes and collapse on the couch. I’m not ready for bed just yet. The house sings a soft lullaby in the breaths of heat from the ceiling vents, in the distant hiss of running water. Nathan must be brushing his teeth. The sounds relax me, and my eyelids grow heavy. A few minutes later, Nathan saunters into the living room in his blue-and-white-striped pajamas. “Don’t be long.” He heads to bed, and I close my eyes. I’m dozing off, drifting through a grassy field, the sky darkening, the ocean crashing against a distant shore. The field dissolves into the classroom. I’m helping Anna relax her diaphragm, and she smiles at me, but she is not Anna. She is Lauren, her grin malevolent, her teeth sharp. She’s going to drain me. I look around for a weapon. But there is nothing. Lauren lunges for me, and I shove her, knocking the wind out of her. I can feel the cold night air on my skin. She tips backward, and we’re both tumbling through space. Time passes, minutes, maybe hours. I wake with a start, my throat parched. I sit up quickly, gasping in the dimness. I’m cold, groggy. I stagger to my feet. What time is it? I can’t think straight. The clock in the kitchen reads 12:15 a.m. The full moon climbs high in the sky. I can hear the rhythm of the surf in the distance. My black flats sit on the floor next to the couch. I pick them up, tiptoe down the hall to the bedroom. I change into pajamas in the darkness, slip into bed beside Nathan. He’s snoring softly. I drift off again, lost in a deep slumber until a noise awakens me. Perhaps it is the box spring creaking, the shifting of the mattress as Nathan gets out of bed. The digital clock on the nightstand reads 2:05 a.m. He’s trying to be quiet, but I hear his breathing, watch his dark silhouette through the haze of my lashes, my body heavy with medicated sleep. Through the slightly open window, night sounds seep in—crinkles in the underbrush, the drip of residual rain from the downspouts. The air smells cold and clean. At first, I’m sure he’s going to the bathroom, but he’s moving in stealth, pulling on pants, sweater, and shoes. Does he have a night shift? He said he didn’t. Not this time. I want to reach out to him, to say something, but my mind is foggy. I keep my breathing even, as if I am asleep. He’s looking at me in the darkness, I think. I can’t tell. He turns his back to me and bends his head down, his face faintly illuminated by his cell phone. Is he sending a text? Reading one? If there is some emergency, he would say so. He would wake me. But he doesn’t. He slips out into the hall and pulls the door shut behind him. Cotton clouds drift through my brain, and I hear the distant yapping of Arthur Nguyen’s dog, two doors down. When I wake again, a floorboard creaks in the hall—a door shuts softly nearby. Someone must be up, but this time it’s not Nathan. He’s in bed beside me, his breathing soft and regular. It’s as if he never left. Next thing I know, it’s 6:45 a.m. Perhaps everything—the door closing, the creaking floor, and Lauren—was all a dream. I get up quietly and change into jeans, sweater, socks. Nathan doesn’t move. I need to get out of here. In the foyer, I bundle up in my overcoat, put on my sneakers. They’re still damp, probably from yesterday’s walk, a few blades of grass clinging to the soles. Out in the crisp dimness, I take the path back through the garden. My faint shoeprints lead me through the dirt. Also from yesterday—must be—but it rained last night. Strange. I shiver and glance over my shoulder, half expecting to see a shadow of myself racing up behind me. I descend the long staircase to the beach. When I reach the bottom, I turn right, heading north along the rocky, detritus-strewn shoreline. My legs are shaky, but the farther I walk, the stronger I feel. The more alert I become. When I reach the headland, I turn back, leaning into the wind. The madrone and fir trees at the top of the bluff lean dangerously. Nathan’s disappearance in the night now seems almost ordinary. Almost. He went out for some air. Or to talk to someone at work. No need to worry. We’ll live happily ever after. Nothing will stand in our way. And I won’t take that medication again; I’m fuzzy-headed. I’ve got too much to do putting up my little house for sale, choosing furniture to bring to Nathan’s place. This is real, my decision to move in here. The future is already in motion. I lean into the wind with renewed resolve. I’m nearly back to the wooden steps up the cliff when I spot a pile of clothing—or a large clump of kelp—several yards south of the steps. I pick up my pace. A dull headache pushes at my temples. I duck my chin against the gale, my running shoes pumping below me. My toes go numb. The cold claws at my bones. I should’ve worn the new silk long johns Nathan bought me for winter. As I round the promontory toward the dark heap in the sand, the beach widens ahead of me, and I come upon a broken umbrella lying askew at the bottom of the bluff, the handle embedded in the sand. Like an exotic bird that has tumbled down from the clifftop. I recognize the bright-blue pattern of Laurel Burch cats, and my pulse quickens. I can’t move fast enough. Pebbles sneak into my shoes and slow me down, but I’m close enough now to see. The pile of kelp is not kelp at all, and it’s not a clump of clothing. It’s a woman in a long, black coat. She’s lying on her stomach, her head turned to the side, her legs at a peculiar angle, one bent backward. She’s barefoot. Her dark hair blows across her face. I rush toward her, kneel next to her. I’m light-headed, afraid I might faint. I try to shake her, but she doesn’t respond. Excerpted from After Nightfall by A. J. Banner with permission from Lake Union Publishing. Copyright © 2018 by Anjali Writes LLC. All rights reserved.